1) Up to 30% of heat loss from a home is through glass doors and windows – nearly as much as the heat lost through the ceiling. 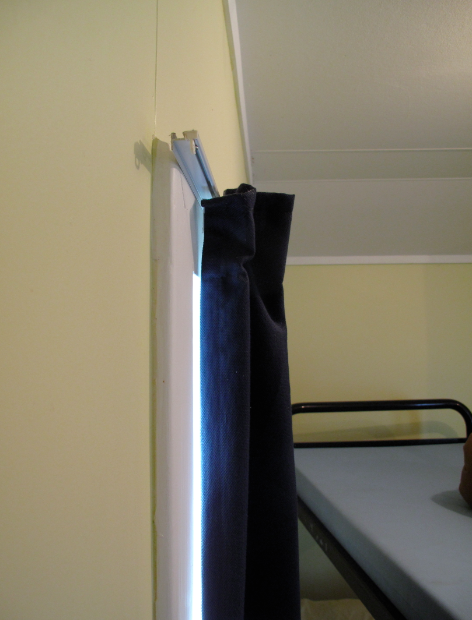 2) Thermal curtains are sweet-as, if they are fitted properly. 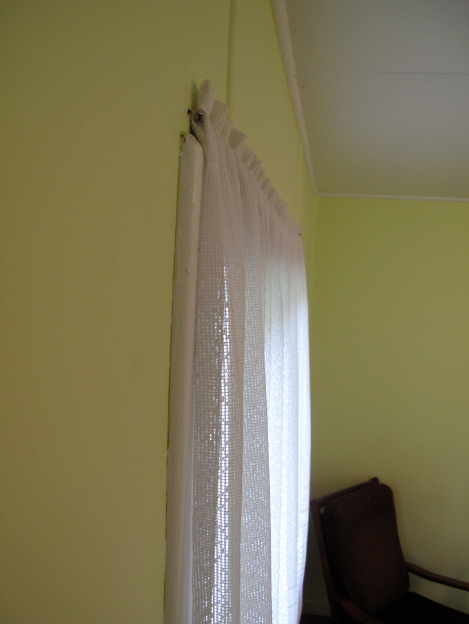 The sad truth is that most of the curtains I’ve seen in Whanganui are not fitted for high thermal performance, ie: insulation. Recently, Verti, Dani and I spent the night at an accommodation outside of Whanganui, which I’ll use to illustrate my point. The unit in which we stayed was a bit schitzophrenic in that it employed three distinctly different approaches to curtaining: the good, the bad, and the ugly. I’ll start with the bad because it is the most common thing I see in homes where the occupants are not even aware that: 1) it is poor curtaining; and, 2) they are losing heat unnecessarily. When it comes to holding heat inside of a home, a standard arm-hung curtain rail without a pelmet or floor-length curtains is almost like having no curtain at all. 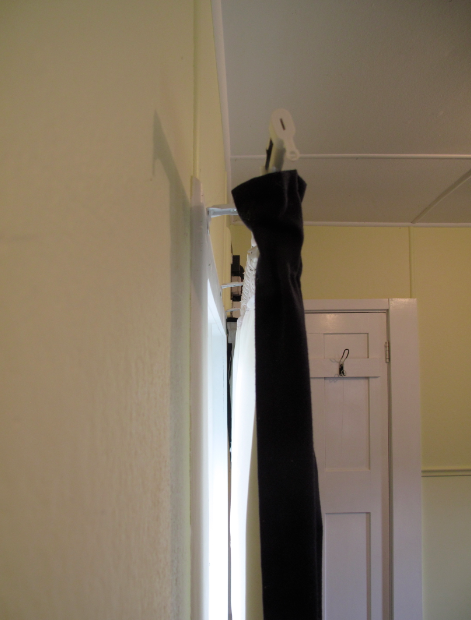 Even the best thermal curtains are practically useless if air can flow uninhibited behind them from top to bottom. This is due to physics (Hurray Science! ), and the inverse of a principle we learned in school: hot air rises. Luckily, it does not take a physicist to figure out that if hot air rises, then cold air sinks. Now that we have the science sorted, on to a tale of loss, betrayal and ultimately sorrow. The loss comes from warm, indoor air coming into contact with a cold pane of glass. Heat is conducted through the glass to the outdoors, leaving the indoor air colder than the air directly below it. This cold air sinks, creating negative pressure – or a vacuum – between the curtain and window, which pulls warm air from the ceiling down and against the cold glass. This air cools and sinks, causing another vacuum that pulls more warm air down from the ceiling. Nek minit, a convection current ‘in reverse’ is flowing through the room, cooling it down every winter night of the year. Naturally, a sense of betrayal consumes the occupants of the room when they discover that the expensive thermal curtains they’ve purchased might just be useless! Shortly thereafter, the sense of betrayal turns to sorrow when they realize how long they have been needlessly losing heat and that they should have paid closer attention during physics class in school. The two common ways to prevent the above from occurring were well-known to our grandparents: pelmets and/or floor-length curtains. Contrary to what most people believe, pelmets are not just a beautiful accessory to a well-appointed home; they are an energy-saving device. Form follows function. However, due to advances in curtain-hanging technology of which our grandparents never dreamed, a third possibility now exists from preventing the dreaded convection current in reverse. Although I am unaware of the official name of this technology, I have come up with my own: Screw-it. What possibly could be a more elegant description for screwing a curtain rail into the wall directly above a window? I characterize this as the good because it does restrict the flow of air behind the curtain from top to bottom, just not as well as a pelmet or floor-length curtains. But hey, nothing wrong with a bronze when only three medals are being awarded. As for the ugly, to quote my Himalayan eco-engineer friend, Sonam Wangchuk, “Warm is always beautiful.” If warm is beautiful then cold must be ugly, and lace curtains do nothing to prevent heat loss through windows, even if they are fixed hard against the frame.